It’s easy to take running water and a bar of soap for granted until you’ve been at a music festival for three days and you can no longer tell which tent the B.O. is wafting out of. A start-up in Seattle solved that problem by creating a “shower” that you can carry in your pocket. Epic Wipes founder Aeneas Janze became inspired while serving in Afghanistan, where shower access was not guaranteed. He and the other soldiers regularly used baby wipes to clean themselves, but there was one problem — those wipes were designed for babies. They were way too small. Janze created wipes that are 16 times bigger than the average baby wipe. 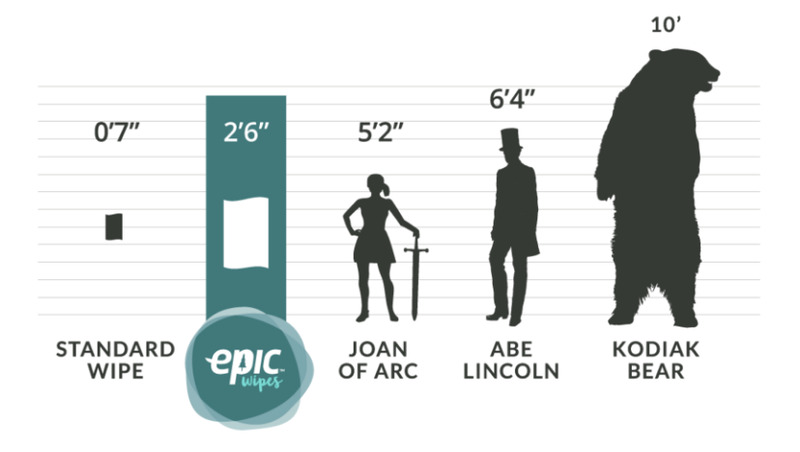 Epic Wipes are portable, individually wrapped, and unfold to the size of a bath towel. They’re made of bamboo, water, and antibacterial essential oils, so they’re easy on your skin and the Earth. Janze developed this project for three years before he recently launched it on Kickstarter, seeking $10,000. The company quickly surpassed that goal and has raised over $24,000 so far. While they were originally designed for sports, military, and outdoor adventure use, it seems these giant moist towelettes can be used for pretty much anything. So there you have it. You never have to shower again.